The latest on substance abuse news and trends. Take a look at some upcoming events for the 30-county region. Check out our Facebook page and keep up to date with events, prevention messages, and more! 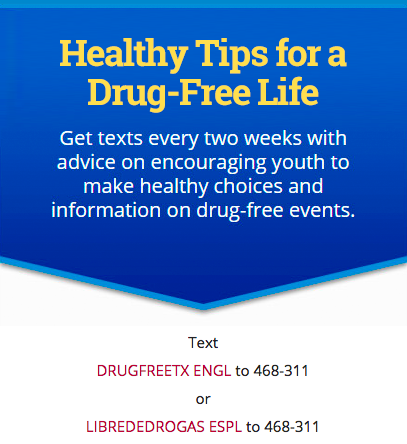 The Prevention Resource Center aims to provide information and statistics on substance abuse in the Texas Health and Human Services (HHSC) region 7. Every year we put out numerous PSAs aimed at reducing marijuana use, underage alcohol use, and prescription pill abuse. We have a member of our team go out and perform tobacco law compliance checks with tobacco retailers across the region. We also put out a Regional Needs Assessment which synthesizes various statistics about alcohol abuse, substance abuse, risk factors, and protective factors in the region. What does the PRC do? The regional needs assessment is produced every year and is a collection of substance abuse, risk factors, and protective factors data for the central Texas region. In addition to distributing the Regional Needs Assessment (RNA), we take specific requests for data related to alcohol and substance abuse or risk and protective factors in the region and create smaller snapshots for the region. We coordinate trainings for prevention orginazations in the 30 county region to ensure that they are up to date with the latest information, ethical considerations, and youth prevention programs. We build ties with the community through participation in various coalitions across the 30 counties. Through this, we build support to help ensure that the coalitions are successful in their ventures. We create and broadcast, through various mediums, Public Service Announcements (PSAs) in order to get the message of drug use prevention out to various communities in the 30 county region. We go out into the communities across the 30 counties and ensure that places that sell tobacco are up to date on compliance with state and federal tobacco laws. Most counties saw small changes in dropout rates from 2013-2015 except for Mills County which increased by 17%. The number of incidents in schools related to alcohol, tobacco, and other drugs increased from 2014 to 2016 the most counties with Travis, Burnet, and Williamson having the highest rates. The only big change from 2014 to 2016 in drug seizures was an increase in Opiates seized, with Marijuana, Cocaine, and Meth remaining the most common drugs seized. Since 2008 there has been a slow decrease of parental disapproval of tobacco use while there has been a slow increase in parental disapproval of marijuana use. Students in regions 7 & 8 are more likely to have no friends who use alcohol, marijuana, and tobacco than the state at large. Perceived access to alcohol, tobacco, and marijuana seems to be decreasing among youth since 2008. 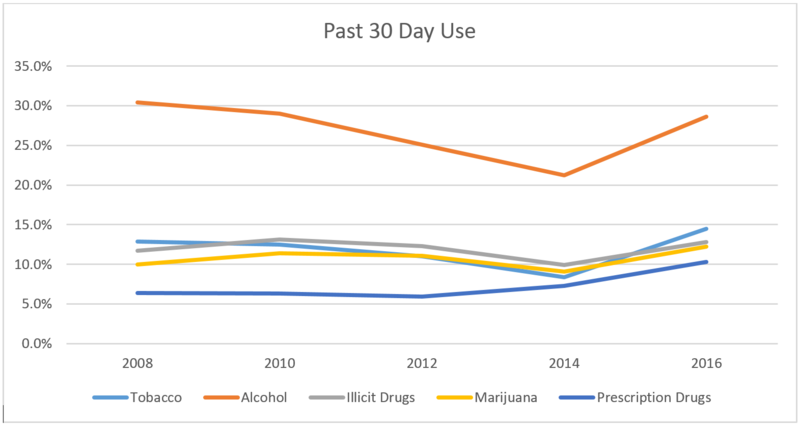 Perceived danger of alcohol, marijuana, and prescription drugs seems to be decreasing since 2014. Lifetime use by 12th graders of prescription drugs seems to be slowly increasing among students. Since 2014 there has been a dramatic decrease in the number of pounds of marijuana seized. There has been an increase in the number of opioids seized. There has been an increase in the number of pounds of methamphetamine and amphetamine seized. 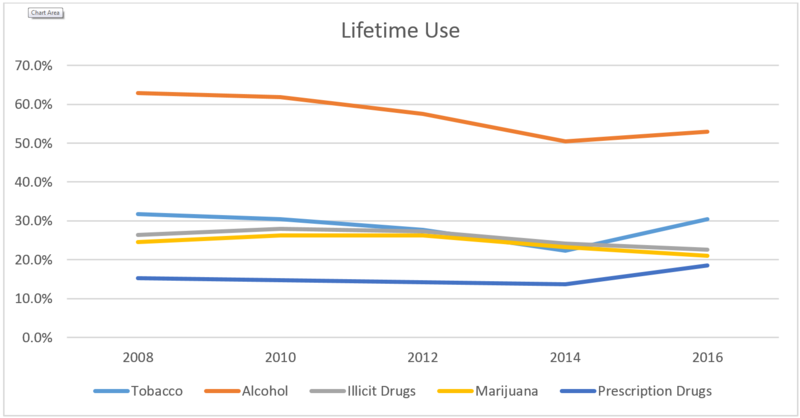 In general substance use among youth has been relatively steady with a slight decrease over time if any change at all. However, between 2014 and 2016 there was a sharp increase in past 30 day use and a slight increase in lifetime use according to the Texas School Survey (TSS) for region 7. Alcohol is the primary substance used with 50-60% of youth having used it at some point in their life. Tobacco, marijuana, and illicit drugs have remained fail constant with prescription drugs seing a slight uptick in the most recent TSS. Alcohol is the primary substance used in the past 30 days with the rest of the substances remaining stead except for an uptick in the most recent TSS.